A San Diego Stair Adventure! | Keep It Up, David! We met at San Diego Mesa College, a community college that’s literally on a geographical mesa. The campus is flat, and perched on a bluff above the surrounding neighborhood. 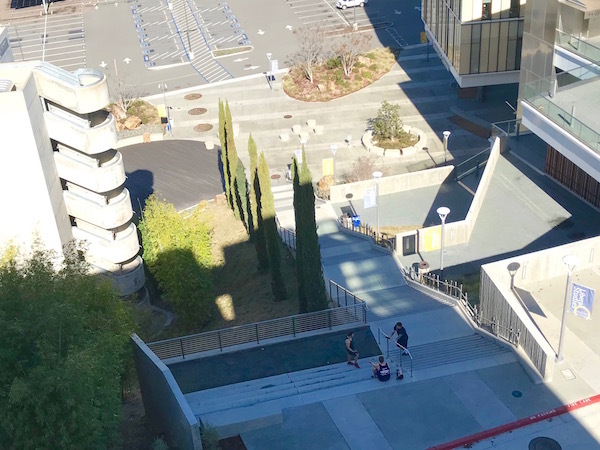 The main parking lot is down below, and connecting the two are… you guessed it… stairs! Z’s been coming here for training purposes for over a decade, and I can understand why. Especially since Z lives only 10 minutes away. The main stairway is wide and grand, next to the Student Services Center. It has 102 steps. See the building in the distance, at the top of the steps? That’s the Math and Science Complex. It has four tall stories, and a great stairwell with walls of windows, with another 107 steps. Some local firefighters arrived halfway into our workout to do their own stair workout – you can see them at the bottom of that picture. 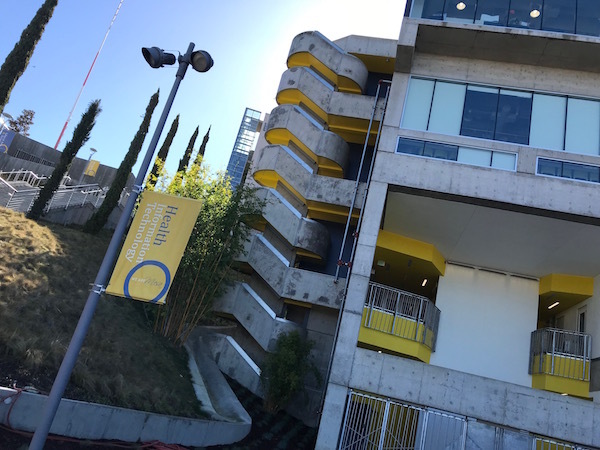 Z and I did eight climbs up both the main stairway and the Math and Science Complex – 209 steps for each of the eight climbs. That’d be a great workout right there, but that wasn’t all! There’s also a stairway on the east side of the Student Services Center, with 94 steps. That’s the first picture in this post. I did this twice, once with Z, and once after Z left. Then there’s a third stairway leading up from the parking lot to the west of the main stairway, behind the English Village. It had 87 steps. I only did that one once. Z had to take off a little before I did, and after he left I climbed the main stairway and Math and Science Building a few more times, and also an 8-story outdoor stairwell in a building that’s closed for construction. (Shhh… I snuck in.) I think it’s some sort of Arts building. That stairwell was tight, with only 7 steps per flight, and I almost felt dizzy after climbing it. So I only climbed it once. 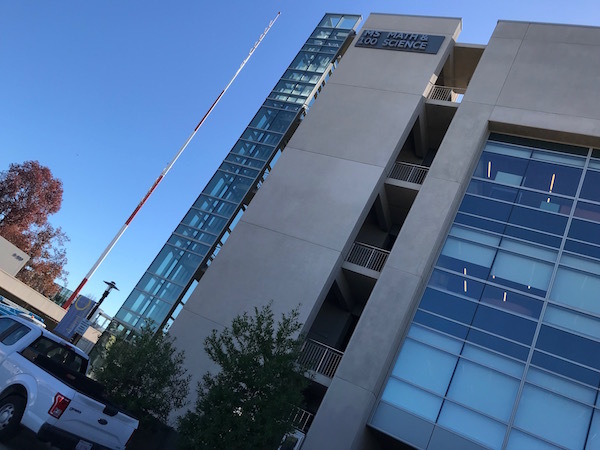 San Diego Mesa College is a really beautiful campus, clean and with some striking architecture and great outdoor plazas, although their logo looked awfully familiar… where I have I seen it before? OH YEAH… My alma mater! All in all, my workout lasted about an hour and 35 minutes. Between climbing the stairs, walking between the stairways, and some slight campus exploration, I covered 2.1 miles. And, also, a whole lot of stairs! 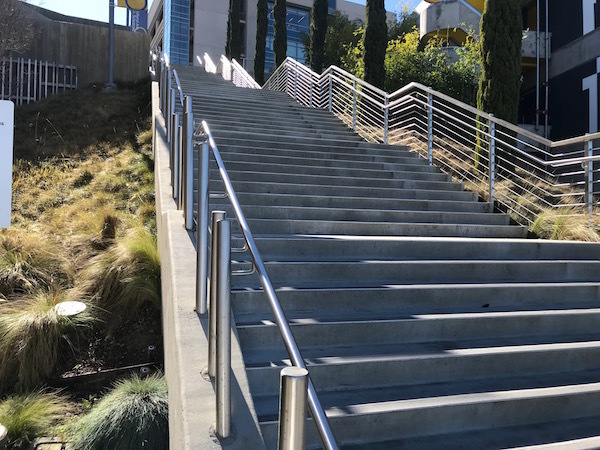 Plus, during our campus exploration, Z and I climbed two outdoor stairways at the Social and Behavioral Sciences Building, but I forgot to count those steps. It’s a three story building, so that grand total would only get bumped up slightly. This entry was posted on Monday, January 21st, 2019 at 8:34 pm and is filed under Uncategorized. You can follow any responses to this entry through the RSS 2.0 feed. You can leave a response, or trackback from your own site. 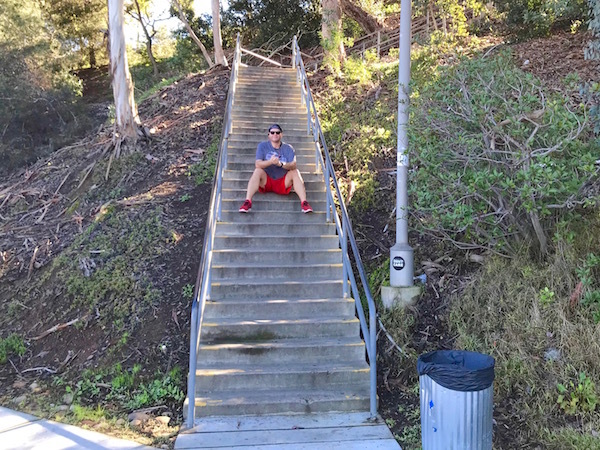 3 Responses to A San Diego Stair Adventure! That’s my Alma Mater, and I live 10 minutes away..it would have been awesome to bump into you out in the wild. Oh sweet! 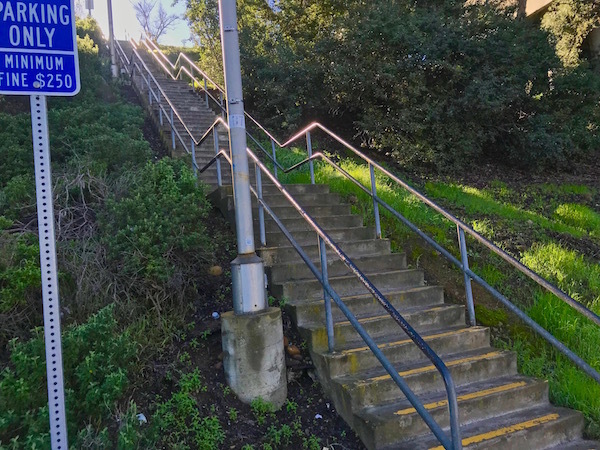 Did you enjoy climbing all those stairs as a student? What a great workout!!! Reading your stair workouts is causing me to become intrigued!!! 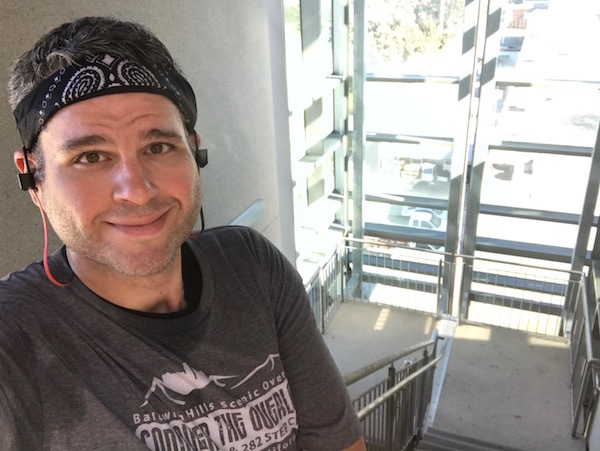 I do know that during the winter I try to climb the 8 flights from the lobby to my floor during breaks and sometimes my lunch….but something more intense sounds like a great workout! !